Ideal for schools and nurseries, this large pack of Poster Paper provides endless hours of fun. Containing 10 individual rolls, each pack has been manufactured from a high-quality 60gsm that cuts easily while being tear resistant. 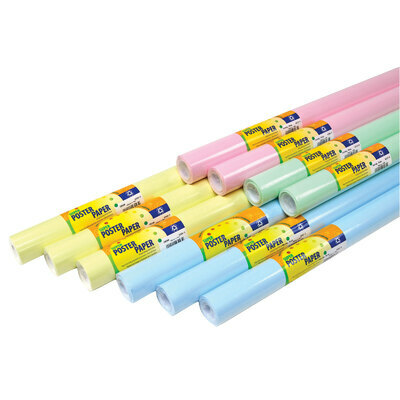 Choose from an assortment of pastel colours to suit each and every task with rolls that come individually cello-wrapped to protect their shape and integrity during storage. A great addition to your existing resources while also promising to engage your entire class during any Arts & Crafts session. While you're here, stock up on our PVA glue and get crafting the moment it arrives. For those creating engaging displays, Our Fadeless and Our Bordette products have been designed to hold their colour, even in direct sunlight and Drawing Pins make the installation step that much easier.